Soften your body and your mind with this slow-paced routine featuring modified Pilates exercises. You will feel invigorated and filled with calm energy after you finish this video. We think of Pilates as a way to strengthen the core and gain control of our bodies. However, sometimes our body simply needs a way to release the tension built up from working out, emotional stress, or daily errands. We rarely find time to stop or slow down so today I invite you to take a little over 30 min to take care of your body with this Pilates-inspired stretch and release routine. detoxify the body and improve digestion with gentle twists. You will feel as if you just had the most amazing relaxing delicious massage – its’ a real “treat” for your body! In this video I am using sFera massage balls because I love the texture and the various ball sizes that come in the set. If you don’t have this set you can use any other balls that you might find around the house: tennis balls, lacrosse balls, kids balls, golf balls etc. The massage balls will help you release tight knots in the muscles and increase blood circulation to the tissues to increase your flexibility and range of motion. However, if you can’t find any balls for this workout please join me anyway. I offer modifications for all exercises without the massage balls as well. Janice Peters: My favorite way to relax at this time of year is to keep up with my Pilates(not skip until January) I also thank God I am alive and blessed with good health, family and friends. Ginny Bowser Smith: Favorite ways to unwind are pilates, cup of tea and a good book!! Christine Szymanski: Baking holiday cookies while listening to holiday music is my favorite way to unwind. Kimberly Borchardt: My favorite way to relax is by taking a nice epsom salt bath with lavender essential oils. Caroline Edwards: Spending time with my husband and son, getting out in the cold fresh air air for long walks and then snuggling under a blanket by the fire! Donna Fiorino: Favorite way to relax during the holidays is to grab a chestnut praline latte and catch up on the books I’ve been meaning to read all year! Bonniebeth Uno: Getting a 90 minute foot massage! Andrea Hook Nichols Snuggle with my boys (kids, husband and dog!) and enjoy a holiday show or book together. Jesseca White: My favorite way to relax during the Holidays is to do a combination of centering prayer and Pilates! Erica Walters My favorite way to relax over the holidays is to take advantage of the days my husband is home by going out with just the two of us. JoshYodgee McDermott: Best way to relax on the holidays is to breath and move with synchronicity and grace, while creating obvious tension and intrinsic stress from head to toe! Mary Fran Dion: Taking a nice run and then just lounging out by the pool with the sun on my face enjoying life’s gifts. 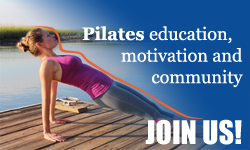 Do you want to receive more FREE Pilates videos? I hope you enjoyed the videos that I shared with you during this challenge. Would you like to see more Pilates videos and free challenges in 2017? Please take a moment to share the video with your friends. Share it on Facebook, Twitter, Pinterest or just the “old-fashioned” email. And please comment and let me know how you liked the video! Your feedback and support are the best holiday gifts for me!